Setting off on a job to photograph Weston-super-Mare’s Enterprise Zone recently, the car began emitting bad sounds and demanded immediate attention from our Motorman in Avonmouth. Now Avonmouth is somewhere that’s always looked pretty dismal in my view and I’ve had no cause to explore it before but with time to kill there while waiting for the repair I wandered about the streets near the station to see if I could find any endearing qualities. Essentially Avonmouth is a Victorian development on marsh land adjoining the Severn created by Philip Skinner Miles, the mid-19thC owner of nearby Kings Weston House – something of a contrast of styles. 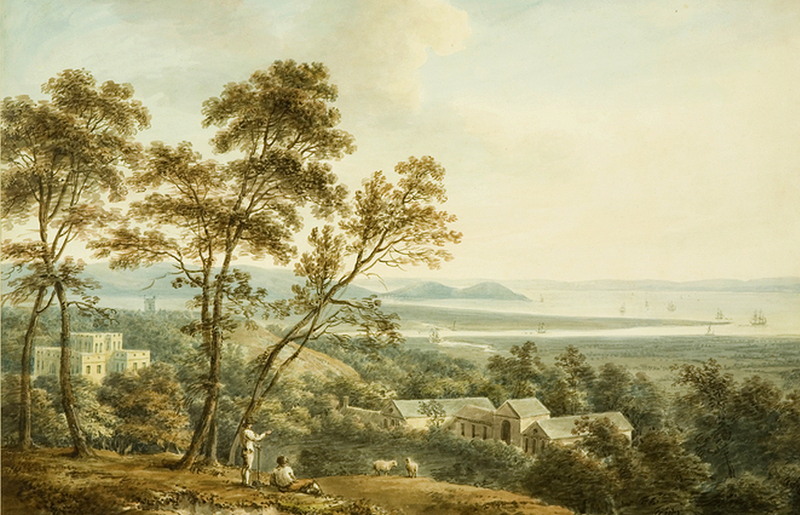 In the 18thC the Vanburgh house and estate had been famous across Europe as a tourist destination and the view from the terrace in front of the house across the Severn dotted with sailing ships to the hills of Wales was much admired and often painted. Sadly Philip Skinner Miles succeeded in ruining this delightful prospect with his new industrial landscape. Although Bristol had been an important port for centuries, by the 1860s the meandering course of the Avon into Bristol prevented access to the increasingly large cargo ships; creating a dock at the mouth of the Avon was a solution and the process began with the building of the railway 150 years ago, followed by the construction of the docks on into the early 20thC. This was accompanied by housing, a Masonic hall, a seamen’s mission, churches etc. However the grandiose Edwardian buildings (some designed by the idiosyncratic architect Frederick Bligh Bond) speak of aspirations for the new settlement that ultimately weren’t fulfilled (a planned formal public square was only partially completed) or have subsequently been unkindly ‘updated’ – the grand Royal Hotel with raised pavement and railings and extravagant corbels of royals’ heads has a disfiguringly modern, plastic canopy over the entrance and the building overall has become a shabby shadow of its former almost regal self. There’s some interesting snippets of information about the town here. But the form and shape of industry and shipping have changed over the last century and a half; from the corner of the Royal Hotel you can still see the now unused tall, 1920s grain silos (allegedly too expensive to knock down), but threading between these ghost structures across the dock site is Europe’s largest coal conveyor that comes under the river from the neighbouring, and more recent, Portbury Docks. It carries coal imported from Columbia, USA and Russia to be distributed by rail (some going through our village on the south-west, Portbury side of the Avon) to Britain’s remaining coal fuelled power stations. The adjacent ‘Severnside’ coastline, along with most of Avonmouth, is part of another Government Enterprise Zone, the coastal strip lined with vast sheds housing distribution centres, logistics firms, energy companies and waste-handling facilities, practically all service industry, nothing manufactured with the exception of the electricity generated by the nine, cloud-tickling windmills. Frederick Bligh Bond would be howling with grief at these anonymous structures – but they’re cheap, and easy to build on flat land. 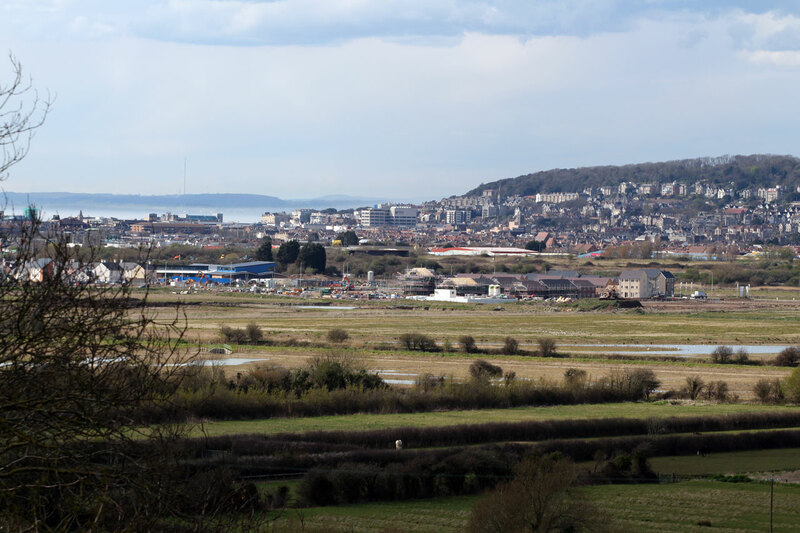 Down the M5 at Junction 21, the ‘gateway’ to Weston super Mare, is more flat land – the same coastal eco-system as Severnside. Much of the area was drained centuries ago for farming with fields networked with rhynes (‘wet fences’ ie drainage ditches), but had been earmarked for development several years ago under the Enterprise Zone status so destined to become clad in anodyne ‘value engineered’, light industrial units like it’s sister site up the estuary. At my first shooting location in an area adjacent to the M5 and Junction 21 there were already some newly built units but also lots of vacant, scrubby fields where some infrastructure had been put in place at the start of the scheme several years ago. But potential roads into these designated sites stop short after a metre or so ending at slack barbed wire fences where the once pristine Enterprise Zone metal hoardings in the fields advertising for tenants are bent, gashed, and pock-marked with air-gun pellets. Until the economic climate makes it attractive for investment this teasel-strewn, motorway-bordered land is apparently often commandeered by competing groups of travellers and their horses, unsettling the neighbouring residents (information eagerly divulged to me by the Neighbourhood Watch representative who came to check up on my credentials as I photographed the area) who live in the acres of new houses laid out to exploit the rhynes as virtual moats, while complex road patterns create an almost gated community. Other flat land within this zone had already been exploited in the 1930s as a civilian airport, taken over in 1940 by the RAF where their adjacent Locking station was providing radio and radar training. After the war the Bristol Aeroplane Company (also makers of the fabulous Bristol cars) began making helicopters here. They were taken over by Westland in 1960 who continued production until 2002 when the site closed down leading to the loss of 350 jobs, but the new Enterprise Zone is promising 10,000 jobs by 2026, so that’s all good. …to become the now familiar Business Parks, Innovation Centres, Serviced Offices and Enterprise Units with extensive housing, in ‘villages’, dispersed among the workplaces. View across Hutton Moor to the new Heywood Village on the site of the old Airfield/Westland Helicopter factory. …with potentially 2,500 new homes perched a mere 6 metres above sea level; could be OK, but it’s the same height as the fields adjoining the Avon in our village that flood at Spring tides. I expect they’ve thought about that though…. 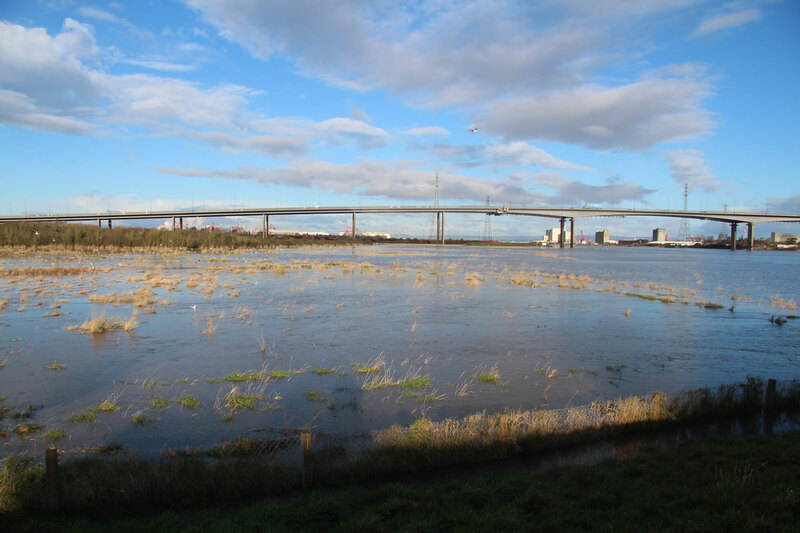 The ‘Longshore’ fields in the foreground on the banks of (or underneath, as here, in Spring tides) the River Avon with Avonmouth, right, and Portbury docks left, beyond the M5 bridge. This entry was posted in Placescapes and tagged architectural features, changing landscapes, climate change, enterprise zones. Bookmark the permalink.